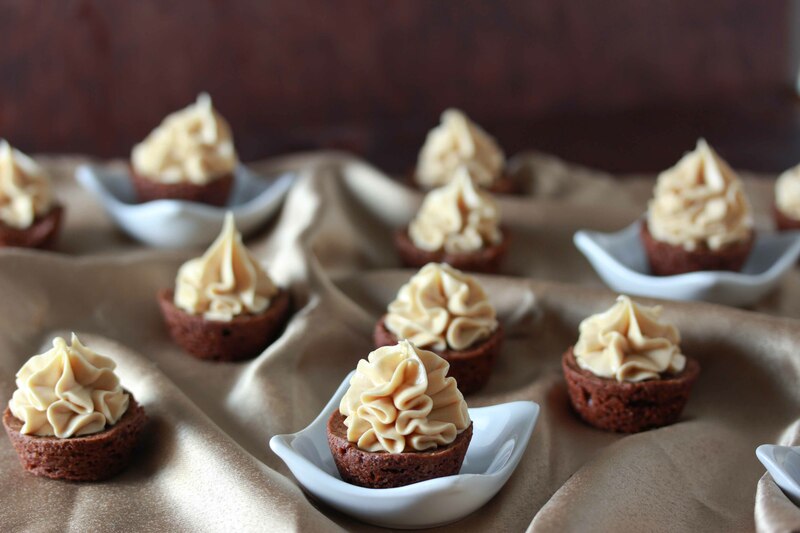 Brownie Bites with Peanut Butter Frosting are a chocolate peanut butter lover’s dream come true! I recently came to an awful realization. I’ve been a horribly neglectful blogger. I am sorry. Really, I am. But this blog is almost a year and a half old, and to date, I only have one brownie recipe posted. Two, if you count my brownie pies. But clearly that isn’t enough. I mean, is there even such a thing as “enough” brownies? I don’t think so either. I realized this as I was going to sleep late on Saturday night. (And if you stalk my Instagram feed, you know that was about a million o’clock, when most of you were probably near waking up.) Anyway, I rectified the situation less than 24 hours later. And I think I made up for over a year of no brownie posts with these amazing treats. Let’s look closer, shall we? First, I made them mini. Because we have established many times over that me and mini are like peanut butter and jelly. Or peanut butter and chocolate, as the case may be. Next, I made these super fudgy and delicious, but I also made a simple recipe that can actually be done without a mixer. 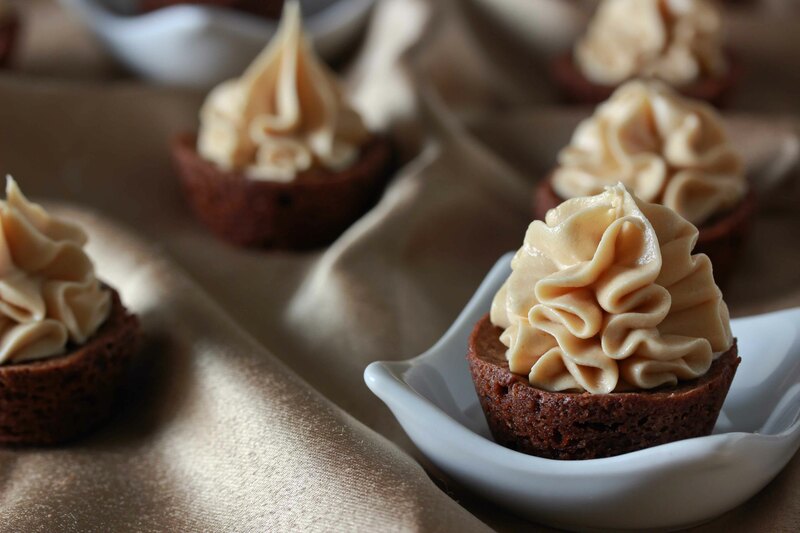 Next, I topped these brownies with peanut butter cream cheese frosting. Let’s let that sink in. Peanut. Butter. Cream. Cheese. Frosting. Because everyone knows that houses in heaven are actually made of chocolate and peanut butter molded together into delicious beauty. Anyway, the reviews are in. Or they would be, if my tasters wouldn’t be so busy stuffing their faces with cream and grabbing for another one. Go ahead. Make these. Then keep making them for a year. I’ll try to post some more brownies meanwhile. Preheat oven to 350. Grease a mini muffin pan well and set aside. In the bowl of an electric mixer, or in a large bowl with a whisk, beat together the butter and sugar until smooth. Add the vanilla extract and eggs, stirring well to combine after each addition. Beat until the mixture is creamy. In a small bowl, whisk together the flour, cocoa powder, baking powder and salt. Stir into wet mixture and beat to combine. Use a small cookie scoop or a half tablespoon measuring spoon to drop the brownie batter into the prepared muffin pan. Bake at 350 for 9-10 minutes, until set. Remove from oven and allow to cool for a few minutes before turning the pan over to unmold. Set brownie bites aside to cool completely before frosting them. And of course, you’ll need some incredible frosting! In the bowl of an electric mixer, beat together the butter/margarine, cream cheese and peanut butter until combined. Add the powdered sugar and beat until creamy. Spoon or pipe frosting on top of cooled brownies. To get the look in the picture, use a wilton 1M piping tip. Thanks for stopping by folks! Hope you adore these brownies! I know I promised you some exciting news last week, and it’s totally coming. Stay tuned… -Miriam PS- are we connecting on Facebook yet? No?! Why not? Thanks! They look heavenly, am going to try this recipe! Thanks Dominikanita! Can’t beat that combo, right? Delicious and rather cute – do you think I could have two or three? love the setup!!!! me want these!!!!!! Well, I know what I’ll be bringing for shabbos!! Wow! These look gorgeous and delicious!! Absolutely going to try this!!! these look irresistible! yum yum! Thank you Paula! Can’t beat chocolate and peanut butter! Exactly! I can’t believe I’ve been so negligent! These look soooo good! I would’ve been a very happy recipe-taster if you had called me :-P.
Cant wait to make these!! Beautiful! I love the peanut butter – chocolate combination. Will definitely have to try these. Was wondering…where can I get some of those mini plates? Enjoy! Try home goods, Christmas tree shoppe or amazing savings for the tasting dishes. 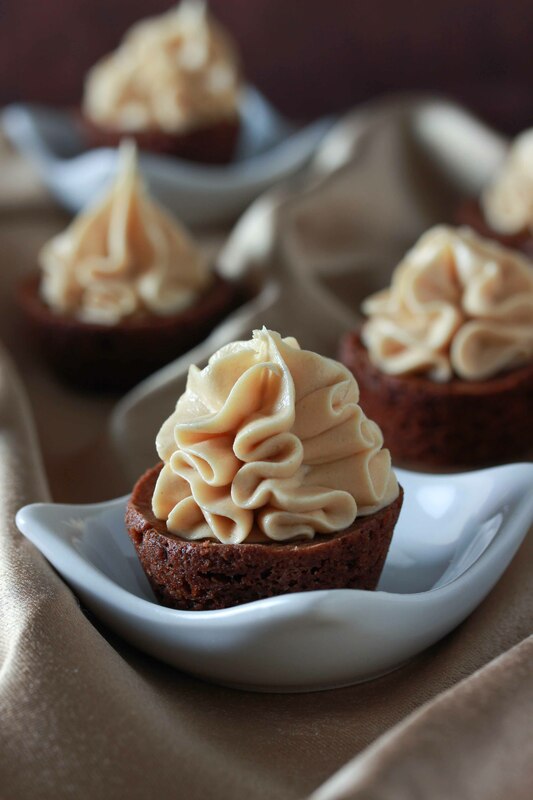 I just made these tonight because my husband loves peanut butter! Between us and our daughter they are disappearing quickly! Love this recipie! Thank you! Awesome, I love to hear that! These look so wonderful and cute! I love pb frosting!! What size muffin pans did you use? Like it says in the recipe, a mini muffin pan. I made these and they are pretty good, but two blocks of butter is a little too much for my taste. Trying to work out how many thousands of calories there might in those delicious minis!!! Look heavenly, I’m scared to make them, I might be tempted to eat them all lol! Hi. These did not work for me. I followed the recipe and bake all the time. They stuck to both the teflon and non-teflon pans. I used cooking spray on both. With all that butter, I’m surprised cooking spray is even needed. Made a second batch and used paper baking cups. They stuck too. Both batches had a divot in the center like they weren’t baked long enough but I already baked longer than recommended. Taste was good but not one was salvageable. I will make mini cupcakes to use the filling which is excellent.